By: Capperucci, R., Loonen, R.C.G.M., Hensen, J.L.M., Rosemann, A.L.P. Abstract: Advanced glazing systems with special spectral characteristics or light redirecting behavior are commonly applied to improve building energy efficiency and indoor comfort conditions. The angle-dependent optical properties of such advanced windows can be markedly different from those of ordinary glass. To achieve accurate building performance predictions, it is necessary to represent the physical behavior of advanced window systems at a sufficiently high level of detail in building simulation programs. However, modelers should be aware that overly complex models are also undesirable, because they are costly to develop and input parameters are difficult to obtain. There is little guidance for simulation users to select an appropriate simulation strategy with respect to atypical glazing properties. This paper introduces a new approach for analyzing the influence of angle-dependent glazing properties, taking into account the effect of location and façade orientation. The potential of this method is demonstrated using an innovative switchable glazing system based on liquid crystals. A comparison between measured and derived transmission properties based on normal angle-of-incidence is presented. Results are presented for three European cities at different latitudes and for three different façade orientations. Using this new approach, simulation users can make informed decisions about appropriate modeling strategies for considering angular optical properties in building performance predictions. By: Koenders, S.J.M., Loonen, R.C.G.M. & Hensen, J.L.M. Abstract - The extensive use of thermal insulation in low-energy dwellings makes them susceptible to heat trapping in warmer periods. Construction elements with dynamically adjustable thermal transmittance properties, so-called dynamic insulation systems, can be a promising solution for reducing this overheating problem, while simultaneously lowering the energy consumption for heating. In this paper, the performance of a novel type of closed-loop forced convective dynamic insulation system is investigated. A simulation model to predict the performance of the dynamic insulation is developed in EnergyPlus. First results show that a ninefold higher U-value can be achieved in comparison with the insulating state of the system. Multiple case studies have been analysed to study the behaviour and performance of the system. It was found that the dynamic insulation system can reduce the energy consumption and increase the indoor thermal comfort of a typical residential building, while using less auxiliary energy than comparable passive cooling systems, such as night ventilation. Applying dynamic insulation to a façade construction with a heavyweight interior partition and lightweight exterior partition resulted in the best performance. If a small period of thermal discomfort is allowed, the closed-loop dynamic insulation system can obviate the need for an active cooling system in the climates of Helsinki, Amsterdam and Stuttgart. Abstract - In this paper, the energy performance of a solar thermal (ST) façade system is studied in relation to its connection to a district heating system. This concept allows for the direct use of ST heat in the building, while taking profit from the network for delivery/selling of excess heat and purchase of heat during periods of underproduction. The use of unglazed collectors for low-intrusive architectural interaction in façades is discussed. Studies are carried out on the heat production of the system and its capacity to cope with local demands. Economic studies are carried out in order to balance the investment and operational costs/profits of the system. In the current context of moving towards more sustainable construction, advanced façade systems that integrate solar collecting devices represent a commitment with future trends that combine renewable technologies with building skins. This paper describes a real experience when combining a novel unglazed solar collector based on sandwich panel technology, a heat pump and a controller that manages the different operation modes. Installed in the Kubik by Tecnalia testing building in northern Spain, the system has been monitored for several months in 2016, under an energy efficiency scope. The study will present measured values regarding the yield of the collector, performance of the heat pump and general efficiencies. Despite significant development in the performance and efficiency of solar thermal technology, little consideration has been given to its interaction within building envelopes, aside from mechanical fixing systems. The lack of solutions for the architectural integration of solar collectors and the complexity of their assembly process remain important barriers for the widespread adoption of this technology. An innovative approach is proposed in which solar collectors are not merely integrated into conventional building envelopes, but instead these envelopes are hybridized and activated to house solar thermal systems. This poses the challenge of adapting solar thermal technology to the capacities and limitations of architectural skins. The paper presents results from three ongoing projects. BATISOL and BASSE investigate the development of solar thermal technology so as to fulfil the functional, constructional and formal requirements of building skins. Façade assemblies are turned into active skins by integrating unglazed solar collectors in the place of conventional renders and claddings. RETROKIT explores the usage of renewable energy gains within an alternative environmental control strategy, by direct supply of heated air into the ventilation system. Finally, a discussion is presented on architectural, constructional and thermal performance aspects of these solutions, based on both design assessments and experimental data. Adaptive building envelope systems have the potential of reducing greenhouse gas emissions and improving the energy flexibility of buildings, while maintaining high levels of indoor environmental quality. The development of such innovative materials and technologies, as well as their real-world implementation, can be enhanced with the use of building performance simulation (BPS). Performance prediction of adaptive facades can, however, be a challenging task and the information on this topic is scarce and fragmented. The main contribution of this review article is to bring together and analyse the existing information in this field. 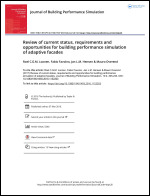 In the first part, the unique requirements for successful modelling and simulation of adaptive facades are discussed. In the second part, the capabilities of five widely used BPS tools are reviewed, in terms of their ability to model energy and occupant comfort performance of adaptive facades. Finally, it discusses various ongoing trends and research needs in this field. Abstract - DALEC is a novel, combined lighting and thermal simulation web tool. This tool allows building designers to evaluate their individual façade concepts in terms of thermal and visual performance and ultimately their impact on overall building energy use. Although easy to use, the software accounts for the complex thermal and light processes in buildings, by way of sophisticated and time-saving pre-calculations. Based on climatic data a calculation of heating, cooling and electric lighting loads can be obtained within a simulation time shorter than one second. The model has been validated by comparison with experimental data and other state-of-the-art software and shows deviations less than 15%. Not only energy demand is considered, but also user behaviour (e.g. glare protection), as well as visual and thermal comfort. This innovative, holistic approach facilitates and accelerates the design of sustainable and energy-efficient building for new, as well as for refurbished buildings.